I once talked about salmon fishing in the Ashburton River with an older bloke who was doing some work on my 4WD Toyota. He told me that as a youngster he could remember a day when as many as 200 salmon were caught at the mouth of the Ashburton River. I’m guessing that had to be 50 to 60 years ago! 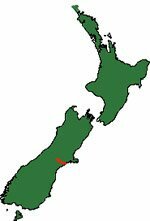 In those days the Ashburton River had salmon runs very similar to those of the Rangitata River further to the south. Alas nowadays the Ashburton is a shadow of its former self. Abstraction for irrigation has all but reduced this once mighty salmon river to a trickle. Some sea-run brown trout still run up through the river mouth when conditions permit – which isn’t very often nowadays. 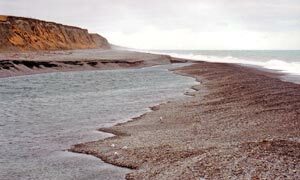 Mostly the lower river seeps through the shingle bank into the sea through the closed river mouth making it impossible for trout and salmon to enter from the sea. As a result of low water flow the mouth of the Ashburton River is often closed off by shingle. Ashburton mouth. Just not enough water for salmon or sea run trout to run up the beach! In Jack Byrne’s excellent book Salmon Country there is a full-page photograph of a huge salmon caught at the Ashburton River mouth in 1978. It weighed 43 lb (19.5 kg). That is now almost four decades ago but shows just how good the trout and salmon fishing were in those days. 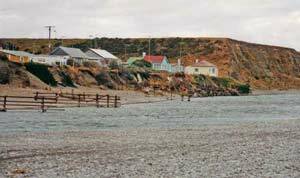 If planning to visit the mouth check with a sports store in Ashburton first to determine its condition. The Ashburton River divides into the North and South Branch on the western outskirts of Ashburton. Generally, the north branch dries out in summer with the remaining flow being below ground. Hence the better fishing will be in the south branch. Mostly there are smallish brown trout in the lower and upper Ashburton River. These smallish trout that weigh up to kilogram or so in weight are best targeted on the fly rod with dry flies and nymphs. The water can get very low throughout the Ashburton River by late summer. Looking downstream of the Ashburton River South Branch. There are some interest small fishing lakes in the mountains of the Ashburton River catchment that are attractive to trout anglers. One, in particular, is Lake Emily which contains brook char up to 2 kg in weight.